Twenty Reservists from across B.C. 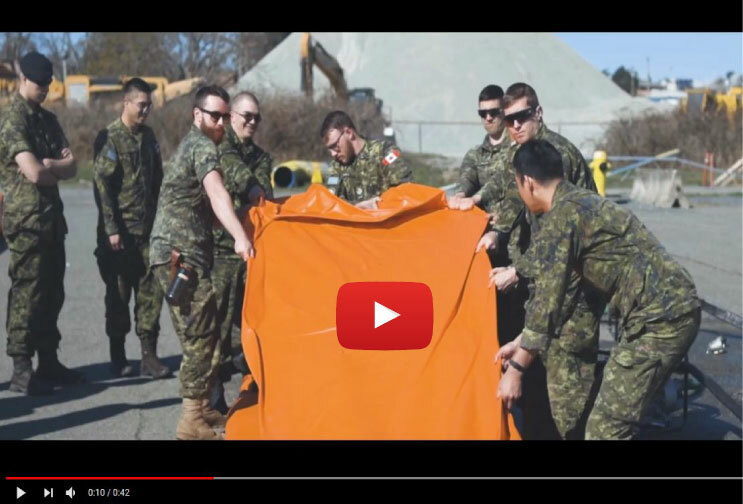 gathered at CFB Esquimalt’s Urban Search and Rescue complex to become the first military members in BB trained on a simple alternative to sandbagging. The Tiger Dam flood control system – originally designed in Canada – fights water with water. Each 15-metre Tiger Dam section replaces about 500 sandbags and folds easily into the next one to make a continuous barrier (the province of B.C. bought enough to cover a 26-kilometre stretch). A small team can set-up a barrier in a fraction of the time it takes to make a sandbag wall and best of all, there’s no shoveling. Did you know that Architectural beauty is good for the soul? Beautiful design in art and structure can actually make you happy. Monuments, museums, historical buildings, such as heritage homes and founding commercial properties, and popular landmarks are physical links to our past. All of these are links to a town or cities historical past and provide the stepping stones to educate future generations about their storied days gone by. Flooding due to storms or high water levels can devastate these historical and architectural landmarks. Tiger Dam™ and US Flood Control provide inflatable barriers that can divert up to 100% of floodwaters and help save important places in history. Give us a call to find out how to have a Tiger Dam™ system ready to divert disaster when high water levels threaten in your town or city. With Nebraska facing one of its worst floods in history, and wide areas of Iowa, Wisconsin and Missouri also flooded, forecasters in the US said today that above-average spring rain and snow will worsen flood conditions until May. This week is National Flood Safety Awareness Week and if you live in a flood plain or an area that is prone to catastrophic weather events, US Flood Control can provide industrial and homeowners with Tiger Dams™ that can save your home, business and property from any event. Don’t wait we have Tiger Dams™ in stock now! Every year, more occur from flooding than from any other weather event. Are you ready for a flood, flash flood or sever weather storm in your area. Protect your family and property. Call US Flood Control and find out how our dams can keep you and your property safe. How Many Types of Flooding Are There? The main causes or categories of flooding are, ravine, coastal & urban, areal and catastrophic. These categories are based on the factors that trigger the flooding such as the source of the floodwater. Areal flooding can occur in any mountainous area where heavy rainfall combined with excessive spring snowmelt overflow flood plains or saturated soil areas. This type of flooding wreaked havoc in Calgary in 2013 leaving water as high as row 10 in the downtown Calgary Flames Saddle Dome. Ravine flooding generally occurs with excessive seasonal rainfall. The end result is the overflowing of riverbanks or the rise in lake levels at the ravine or river mouth. An example of this type of flooding caused extensive damage in the last couple of years in the Okanagan water systems of British Columbia, impacting the cities of Kelowna & Penticton. Urban flooding can be caused by any number of high water events. Rainfall, snowmelt, flash flooding along with aging drainage systems can cause water levels to rise up through sewers, floors, manholes, even toilets making homes and large stagnant areas caustic and unhygienic. Catastrophic flooding has many causes. Earthquakes, Landslides even volcanic eruption can change ocean levels and change water channels to new positions. Failing infrastructure like a collapse of a dam or levy like in New Orleans during hurricane Katrina. Tsunamis are also an example of catastrophic flooding effecting huge coastal areas like Japan in 2011. Many of these types of flooding can be mitigated with the use of Tiger Dams™. Tiger Dam™ is completely reusable, and is the ONLY system patented to connect together to create an impervious barrier for miles, in any shape (circles, 90 degrees turns etc.) and is the ONLY system that is stackable, from 19 inches to 32 ft. in height. Ever Wondered if Flooding Can Be Predicted? What kinds of floods are there? What is a one hundred year flood? What is a thousand year flood? Is their such a thing as flood maps? This information provided by USGS service for a changing world, will give you a good start to understanding more about flooding and what the terminology means. West Vancouver’s Silk Purse Gallery and Music Box buildings are encircled by a “Tiger Dam” to prevent possible flooding from rising seawater due to the combination of an impending king tide and stormy weather conditions anticipated in the upcoming week. According to this article by North Shore News online. How Prepared For Flooding Are You? According to the National Oceanic and Atmospheric Administration the U.S. is experiencing more coastal flooding than ever. In the coming year, “Records are expected to be broken” according to this article https://bit.ly/2RPjy9t at grist. With that in mind what is your flooding strategy if you live or have a business in any of the coastal areas highlighted in this article? US Flood Control & Tiger Dam ™ have emergency systems and plan for all types of flooding events. Contact us at (866) 852-1118 for inflatable dam purchases or team training events and be ready for the flood. Article courtesy of Greta Jochem of grist. In some places New York City is only five feet above sea level. US Flood Control and Tiger Dam™ is doing it’s part to keep rising waters from infiltrating New York’s streets and monuments. With ongoing training for local directors in the use and maintenance of Tiger Dams™ we are proud to be able to help protect many important memorial and historic sites like the 911 Memorial Museum, as we remember those who lost their lives on 9/11.